Show the world you smile. Just don’t show them how you got it. When you first meet someone, your smile is the first thing they see. A beautiful smile radiates from your face and conveys confidence, happiness and joy. If your teeth are less than perfect, chances are you aren’t presenting your best self to the world. You deserve more than that. Gone are the days of metal braces and awkward, encumbering procedures. Through the invention of Invisalign, beautiful, straight teeth have never been easier, quicker and more discreet to achieve. Infinite Point Cook Dental has a combined 40-year history, with experience that draws clients not only from Point Cook, but surrounding communities such as Seabrook and Williams Landing. A member of the Australian Dental Association, we not only are accredited and certified, we approach our business with compassion, transparency and always with you in mind. In the not so recent past, the only way to correct a crooked and misaligned smile was through the traditional means of metal braces. While the end result was typically beautiful, the steps to get there could be painful, embarrassing and awkward. Invisalign is the perfect alternative to help create the smile you crave. It can correct crooked, crowded, poorly spaced teeth and leave you with a straighter and simply more radiant smile. These “invisible braces” have many advantages over traditional orthodontics… more than just aesthetically. The design and fit make for a comfortable experience, with no need to eliminate or change foods you eat or activities you participate in. They are comfortable, convenient and generally require shorter treatment times than traditional braces. Meeting: In our initial meeting we’ll review your current oral history and determine if Invisalign is the right option for you. Plan: To move forward with treatment, we must first determine the state of your mouth. This may require x-rays, 3D digital mapping, or taking moulds or impressions of your teeth. Once this has been reviewed, a treatment plan will be created and will detail everything you need to understand moving forward. 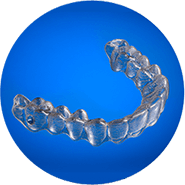 Aligners: Aligners are what correct the teeth and you’ll be required to wear them almost 24-hours a day. A great benefit to Invisalign is the ability to remove them when you’re eating or when you brush and floss your teeth. Progression: In about two weeks time, your teeth will shift to fit the aligner. Every couple of weeks, you’ll be required to wear a new aligner that encourages further improvements. You’ll meet with us, your dentists in Point Cook, approximately every 6 weeks to ensure you’re progressing as planned with new aligners being issued at that time. As you replace each aligner, your teeth will gradually shift into their final position. You deserve this. And it’s never been easier. With the invention of Invisalign, a beautiful, vibrant smile has never been easier to get. Don’t hide behind your smile. Show it off. Call us today at (03) 9395 8400 to talk about how Invisalign can help you achieve your smile discreetly, quickly and beautifully. Go ahead. You deserve it.